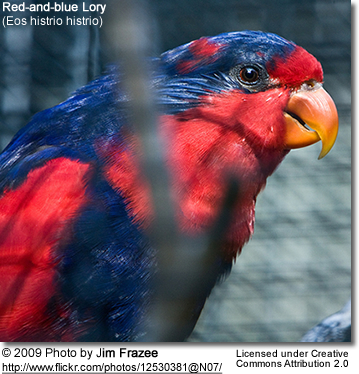 The Red-and-blue Lory (Eos histrio histrio) is / was endemic to the islands of Sangihe and Talaud and some of their outliers off northern Sulawesi, Indonesia. This Lory has/had a very small range and its population is declining owing to habitat loss. It has undergone a rapid population decline, largely as a result of trapping for trade. This species inhabited forests, eating fruit and insects, but also visits agricultural areas to feed on coconut nectar and various cultivated fruits. The main breeding period appeared to be May through June. They nested in holes in tall trees. Flocks regularly made short seasonal movements, and in some cases were found on offshore islands. Talaud Red and Blue Lories (Eos histrio talautensis) - Distribution: Talaud Islands - a group of islands located north of Sulawesi island in Indonesia. The Talaud Islands are also the northernmost region of Indonesia, bordering the Philippines. This strikingly-patterned is red, with orange bill and purplish-blue patch on mid- to hind crown and broad line from eye to mantle. It sports a purplish-blue breast-band, mantle and back. Black scapulars (shoulder feathers), flight feathers and thighs. Its red wing feathers are tipped black. The tail is reddish-purple. Its calls consist of short harsh chattering screeches. The nominate form is considered "extinct" and for them this section may be irrelevant, unless some survivors are discovered. Should this occur, it would be critically important to place any surviving specimen into a highly controlled and well-managed breeding program to hopefully build up populations of this lory. Subspecies and hybridized individuals are still available in aviculture and as pets. 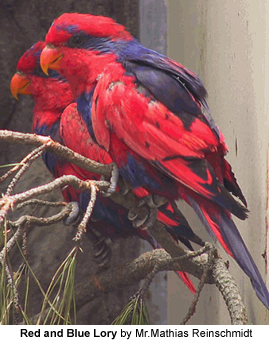 Challenger's Lory was listed as a supposed subspecies of the Red and Blue Lory, but probably invalid. Distribution: Nenusa Islands, Talaud Archipelago, early 20th century? Distribution: Talaud Islands - a group of islands located north of Sulawesi island in Indonesia. The Talaud Islands are also the northernmost region of Indonesia, bordering the Philippines.